Almost everyone carries a smartphone these days. They sit in pockets and on tables. They sleep on headboards and are the first things their owners check in the morning. They’ve edged out more mundane equipment like calendars and MP3 players. They aren’t magical, of course. Or are they? Magic knows your number, and it’s calling you. Launch price of $2.99 for a limited time only! Our fishing boat crested another six-foot wave, the deck pivoting sharply before falling back the other way as we slid into the trough. A deluge washed over the bow, the cabin and the stern deck, drenching us all. The South China Sea was doing its best to swamp us. I fought to keep my balance. Mark clutched at the port side railing, heaving his guts out. 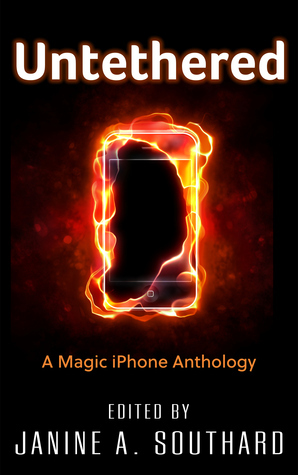 His iPhone glowed in the zippered pocket of his jacket, visible through the thin, soaked fabric. A sailor shouted as he tumbled away, splashing into the half-submerged stern of the fishing boat. “I really don’t think this is the way to Benaroya Hall,” I cried aloud. It started slowly, like most things tend to. I wasn’t fond of downtown Seattle, but Mark went there all the time on work and errands. So he got the cell phone, while I was perfectly happy as the stay-at-home wife with the landline. Why the provider called the house, I’ll never know, but apparently we were eligible for a smartphone upgrade. Mark was thrilled when it finally showed up. Like most technophiles, he couldn’t wait to try out all the newest bells, whistles, and other features. Frankly, I just hoped the mapping function would help with his abysmal sense of direction. The box was classic Apple, a monochromatic brick. I liked to say that their products looked more like candy than anything else, but you certainly couldn’t tell from the packaging. This one didn’t even have any pictures, just a logo on the side in tinted foil. The phone itself was slick, some new design I hadn’t seen any of my friends with. Its edges were wholly rounded, and it didn’t have a port to connect a USB or battery cable. Mark got it all figured out, of course. That’s what he does. Some days he can’t find his rear with both hands, but he’s pretty good with software interfaces. We spent a whole evening on the couch, listening to the bells and finding the whistles and asking silly questions of Siri. It was only the next morning that things started to get weird. I was sitting at the kitchen table, reading the paper over coffee. It was a new blend I had found at a local farmers’ market, but I wasn’t terribly fond of it. Throwing it away would have been wasteful, so into the cupboard it would go, stuffed alongside two hundred others. I’m picky about my coffee. Mark was hunting under the table. His briefcase, phone, and travel mug were all in a pile atop it, ready for him to bolt out the door with as soon as he could find the keys to the car. “Have you seen them?” he asked, now checking behind the knife block on the kitchen counter. “Did you check your other pants?” I asked, taking another sip. Missing keys were a daily occurrence. Almost a kind of ritual, we’d been through it so many times before. The system we’d developed went like this; I would make faces at my coffee, and he would eventually find the keys somewhere strange before rushing off to join the morning gridlock. Mark and I looked at each other. Then we both looked to the iPhone, softly glowing atop his briefcase. Then we locked gazes again. I just shrugged. The microphone must have been on. Some new app feature, I supposed. Mark picked up his phone and walked out of the kitchen. I picked up my mug, trying to decide whether the latest sip had been worth it after all, then followed. “They’re not here,” said Mark. He had both cushions on the floor, and was rooting around in the crumbs and loose change they’d hidden. “You’re most certainly welcome,” she replied.